Enjoy and Help Preserve Hemlock Gorge! Welcome to the Home Page of the Friends of Hemlock Gorge Reservation, a community organization dedicated to preserving and improving Hemlock Gorge, Brian Yates, Founder. Hemlock Gorge is a 23-acre reservation along the Charles River, conceived by Charles Eliot in 1892 and managed by the Massachusetts Department of Conservation and Recreation. Brian Yates, former Newton City Councilor and the Founder, President, and guiding spirit of the Friends of Hemlock Gorge passed away on March 15. He was laid to rest at the gravesite of his mother and father at St. Mary's Cemetery in Needham on Wednesday, March 20 following a funeral mass attended by his family and his many friends and colleages at his church, Mary Immaculate of Lourdes. He was fondly remembered in eulogies by Lisle Baker, Rena Getz, Bob Burke, and Fr. Charles Higgins. Our condolences go out to Brian's family and many friends. 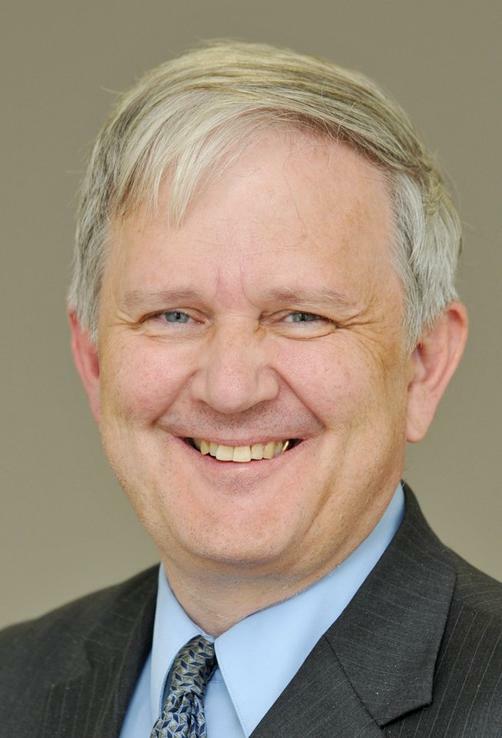 Brian was a friend and distinguished public servant who will be sorely missed. Regular Meetings are held on the first Tuesday of the month at 7:15 in the evening unless otherwise announced. They are are held at the Emerson Community Center off of Pettee Street. Click here for directions. There is free parking. Upcoming regular meetings will be held on Tuesday May 7 and June 4, 2019. No meetings in July. Minutes of the April, 2019 meeting are available here. At our last meeting we decided to proceed with registration of the Friends with the state and apply for 501c3 tax status. New officers were elected: President, John Mordes; Vice-President, Evan Weststrate; Treasurer, Robin Dexter, and Secretary, Sheila Purdy. A memorial to Brian Yates in Hemlock Gorge was approved. To read our 2018 Annual Report to Members, click here. The 2019 report will be issued next December. On Tuesday, March 27 there will be a meeting of our sister organization, The Friends of the Quinobequin at 7 p.m. at the Waban Library. The Friends of Hemlock Gorge are invited to attend. The Friends of Hemlock Gorge’s 39th Annual Spring Cleanup is scheduled for Saturday, April 27, 2019, rain or shine, unless extreme weather is expected. It will be the day before the Run of the Charles. Volunteers should meet at Hamilton Place between 9:30 and 10 a.m. For a MAP showing the location, click here. Parking available at Hamilton Place, the Mills Falls parking lot, and at the Hemlock Gorge parking lot at the intersection of Ellis St. and Rte. 9. Clean-up materials supplied and refreshments provided for all volunteers! Please dress appropriately for the work and weather. We plan to have a lunch available for volunteers after the cleanup, at noon. 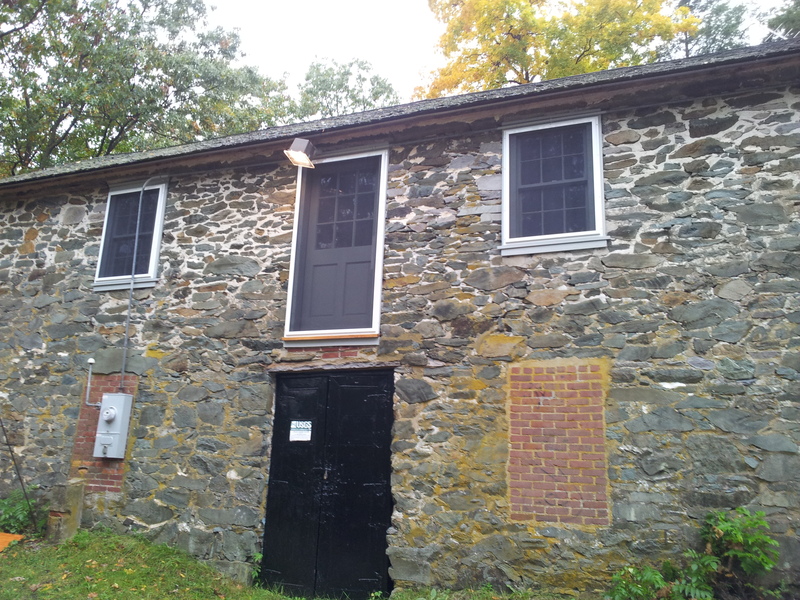 At our October, 2018 meeting, Evan Westrate announced that fencing for the Stone Building project has been fabricated and installantion is now complete. The new railings, shown in the photos to the right, taken during construction, are gorgeous. This project has been champrioned by Evan who announced last December that the DCR approved our public-private partnership proposal to replace the fencing by the Stone Building. The Friends have contributed $7,000 and the state $14,000 to the project. the official letter of commitment from the DCR was received last spring. We all congratulate Evan on his tenacious work on behalf of all of us in bringing the project to a successful conclusion. 2019 Annual Summer Picnic: The Friends of Hemlock Gorge’s Annual Summer Picnic is tentatively scheduled for Tuesday, August 6, but perhaps it should be changed to a weekend. Let us know what you think. It will be on the May meeting agenda. Echo Bridge is one of outstanding landmarks of the Metropolitan Parks System. Built in 1876, Echo Bridge was designed by the Boston Water Works (BWW) to carry the Sudbury Aqueduct over the Charles River. The largest of its seven arches is 130’ in length, which made it the second longest masonry arch in the United States. The bridge is remarkable for its graceful and handsome granite and brick design that contribute to the rugged beauty of Hemlock Gorge. The historic cast iron railings pictured above are an integral component of the promenade over which pedestrians and bicyclists traverse daily. After 140 years, however, they are now in serious disrepair. 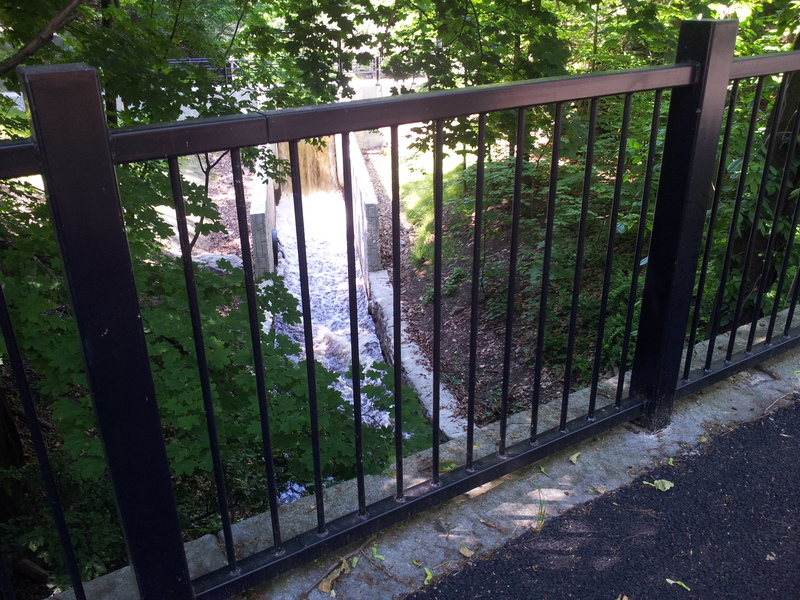 In 2008, the MWRA installed a temporary chain link safety fence inside the historic railings to enable the bridge to remain open. The time has come to either raise the funds to properly replicate the historic railings or to install a more permanent and attractive safety railing system inside the historic railings while leaving the old railings themselves in disrepair. Everyone prefers the former path if at all possible. While State Rep. Ruth Balser was successful in allocating $250,000 in a past transportation bond bill for the railing project, full costs for the project far exceed that amount. 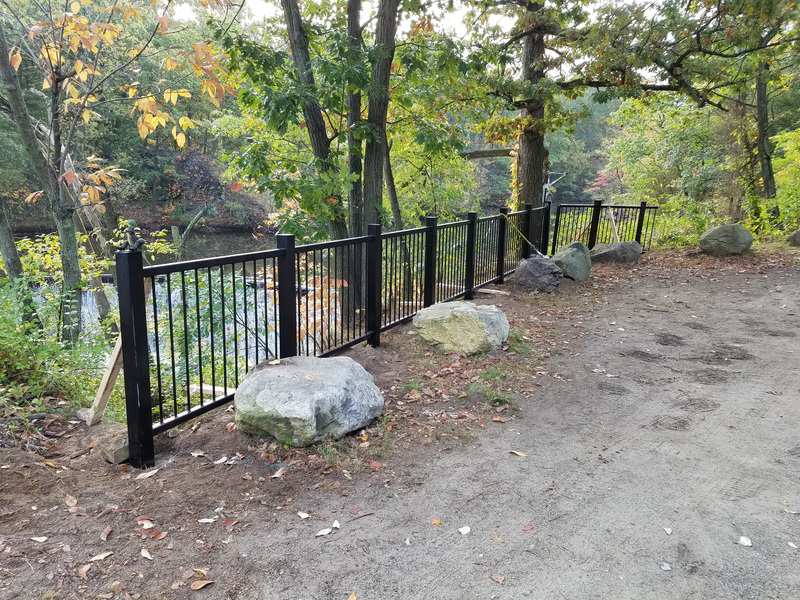 In response to the fact that the MWRA cannot fund historic preservation projects decoupled from its water supply mission, a group of citizens has joined together to help raise funds to fix the historic railings, and we invite your support. For more information, please see the minutes of the February, 2019 meeting, other materials on our website and our flyer. Funds are being sought from multiple sources via a private/public partnership so that the expense of proper restoration is shared across a variety of stakeholders and contributors. Sources will include State funds, Newton and Needham Community Preservations funds, historic foundations, and private contributors. MWRA, the bridge owner, will be the funding recipient and will provide the engineering, contracting, and project management expertise to conduct the project. Will you join us in a pledge? To see stories about Echo Bridge that have appeared on our web site go to: Archive of Echo Bridge news stories. To read a very detailed government report on the Echo Bridge railings, provided to us by Lee Fisher, click here. The 2018 Annual Year-End Report to Members is online. Click here to read it. Our Annual Picnic will take place on Tuesday, August 6, 2019 across the river from the usual location(Hamilton Place) from late afternoon to dusk. Through the efforts of Bob Burke, a plan was made to treat the hemlock trees in the Reservation with an insecticide on Arbor Day, April 29. Jason Lupien of Lupient Tree Service was organizing the program to prvovide the labor at no cost, if the Friends could purchase the insecticide. See the minutes of our April, 2016 meeting (click here ). Unexpectedly, the DCR announced that they had decided to undertake the treatment at no cost to the Friends. Ken Gooch of DCR and two USDA staff did in fact treat the trees on May 23. Brian was there to observe during the morning. He reports that they did dozens of trees from the pathway to the overlook to Echo Bridge, including some of the very tall ones near the bridge that look pretty sickly. If the treatment works, the results should be spectacular. They said they were going to spend the rest of the day treating trees and that they had plenty of supplies. Arborist Ken Gooch of the DCR was at our June meeting to update us on the treatment of the hemlocks. At the moment the trees are in greater peril from the elongated hemlock scale than the adelgids. Lisa Barstow of the DCR updated us on the fence project, and Marti Rudi, also of the DCR, updated us on the stone building shingles. For more details read the minutes of our VERY informative June, 2016 meeting; to do so click here. State authorities have completed reconstruction of the Eliot Street Bridge reconstruction at the southern end of Hemlock Gorge Reservation. Restoration of the meadow is proceeding. For details click here. To read Ken Newcomb's account of the long history of this bridge in Makers of the Mold, click here. The Annual Fall Cleanup of Hemlock Gorge was canceled due to a nor'easter. It was not a lovely day and everything had to be deferred. The Stone Building windows and screens are installed. See pictures to the right and below. We are planning a dedication event for the spring, probably in April. Seana Gaherin and her volunteer committee successfully arranged the second of her Upper Falls Residents outdoor luncheons on June 23, 2017. The food was delicious and Jerry Reilly entertained us all with grandeloquent rap singing. A grand time was had by all. The 2018 Feast will be in July. Our 2013 Spring Cleanup went well, though our invited guests were unable to attend. Most folks seemed to think that putting a fence like that near the new spillway should be our next project. We'll try to post some photos. The dam is completed and the dedication was held in late November, 2012. The efforts of the Friends were recognized and President Brian Yates was an invited speaker. Melissa Moody, a Girl Scout working with Site Supervisor Erica Aubin, has put in place a remarkable signage project running along the Quinobequin Road trail, downstream of Hemlock Gorge. Instead of static signposts, she has installed interactive signage with QR barcodes. Go have a look and bring your smartphone and QR barcode reader. It’s the future of nature trails, and we should plan something similar for Hemlock Gorge, perhaps with the Troop 242 Boy Scouts. Melissa's website is www.qbqtrail.org Very Impressive! Biggest news is that the Arboretum is planning to save some of its hemlocks using new technology. "I met with Peter Del Tredici at the Arnold Arboretum and then went over to see their hemlocks. Peter had good news and bad news. The good news is that there is, indeed, a new hemlock treatment that is good for 5 years. It involves placing a chemical substance in the soil rather than injecting it into the tree.The bad news is that at least 60 percent of a tree should be free of adelgids for this treatment to work. This can be quite expensive. He thinks we should look to saving perhaps half a dozen of the healthiest trees. He also stated that 2011 was very bad for all the hemlocks because of the warm weather. Western hemlocks are more resistant than Eastern ones, but they don't do as well here because of the colder winters and drier summers. He says we need a professional tree company to determine what can be done. He was reluctant to recommend one, but then casually said that Hartney Greymont of Needham is very reputable and one of the best. I had a look at the Hemlocks back in April or May, but have had a very bad ankle tendonitis that makes it difficult to walk up hills or sideways. Maybe we could all go around and take a look at the trees during the cleanup in October. The Hemlocks at Arnold Arboretum are also worth seeing since they have been treated and look fine." Windows are fabricated and have been installed! As soon as the prtective screens are put in front of them, we will be able to see and enjoy them--probably before 2013. Of course, we'll have to have a party to celebrate and thank the Sangiolos for their generous support of this much delayed project. The Charles River Wetlands Trail, located downstream of Hemlock Gorge, on the opposite side of Route 9, less than a mile away. The trail features signage that uses QR barcodes that a hiker with a smartphone can use to learn more about the flora and fauna near the sign. Click here if you are interested in exploring these wetlands. Sound! Click to hear the Charles as it flowed over the Circular Dam on November 9, 1998. A Walking Tour of Hemlock Gorge by Ken Newcomb is available for printing. A trail map for printing will be posted by 2020. Friends' activist Jerry Reilly had an editorial printed in the Newton Tab. Regrettably we do not have a link. 2012 Spring Cleanup Friends of Hemlock Gorge’s Annual Spring Cleanup took place on Saturday April 21 and was a big success. We had more than 30 volunteers on a perfectly wonderful spring day. We extend our thanks to everyone who volunteered, to the DCR staff and Site Supervisor Erica Aubin who provided support, and to Dunn-Gaherin's Restaurant who generously provided lunches for the volunteers. For a photo album of the event when available click here. With regret we have to announce that modernization of our website is delayed indefinitely. Friends member Bob Burke not too long ago wrote a lovely guest columnist article about Hemlock Gorge and the Friends' activities that has appeared in the Newton Tab. Highly recommended. Click here to read it. We have moved older Echo Bridge stories that have appeared on our web site to our Archive of News Stories. This is where you will find news of awards, encroachment, politics and such. For news about key concerns of the Friends like the adelgids, Echo Bridge, and the Stone Building are below. In Waban, there was trouble with the trails along the river. See an opinion article and accompanying blog by Jerry Reilly and a front page news article, both in the Newton Tab. This walk took place on a gorgeous day, with about three dozen people in attendance. Everyone agreed that Hemlock Gorge is both a beautiful place to walk and the site of much historical importance as Newton's first industrial center. Old maps and photographs helped the group to visualize the mills that were located on the island and along the Charles River and to appreciate the importance of Worcester Turnpike/Route 9 to the area's commerce. The walk was expertly led by Lucy Caldwell-Stair, with whom the gourp found the site of the 1893 Echo Bridge Park amphitheater and the cave, the "Devil's Den," where Native Americans stored dried fish. The woolly adelgid has now been in the reservation for some 15 years, and it is unclear how many of the hemlocks will survive. We have moved older adelgid stories that have appeared on our web site to: Archive of adelgid news stories. We have archived the entire saga of the adelgids' appearance, our efforts to pass legislation to combat them, the release of the predator ladybugs in 2001, and follow up analyses in the Friends' Adelgid News Stories Archive. Below are some highlights and links. The Newton Tab declares the Adelgid Vanquished! (2005) Click here to view the story. The Arnold Arboretum's Response to the Adelgid (Winter 2005) Click here to view the story. Hemlock Woolly Adelgid Website (January 2005) The USDA Forest Service now has a website dedicated to the woolly adelgid. The site includes all the of the USDA's newsletters on the pest, pictures, and a great deal of technical information. Interestingly, the Forest Service is looking at several different control insects, not just the P. tsugae ladybugs we released. Click here to go the to US Forest Service adelgid website. Mark McClure, who was a leader in adelgid research and discovered "our" ladybugs, retired. About our Ladybugs (2001) Click here to view the story. About Adelgids (2000) Click here to view the story. 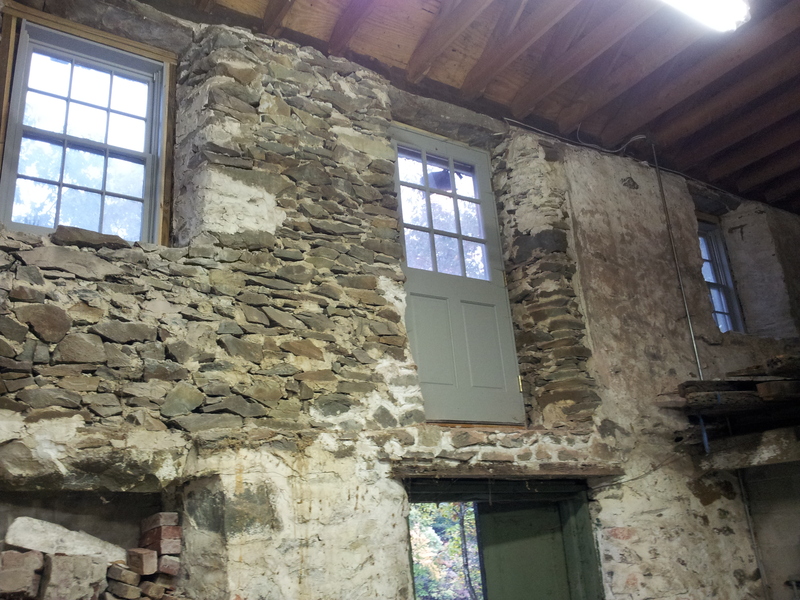 The new windows for the Stone Building, donated in 2002 and fabricated in 2008, are awaiting installation. In early January, the Friends of Hemlock Gorge succeeded in our application for a Public-Private Partnership with the Department of Conservation and Recreation (DCR). 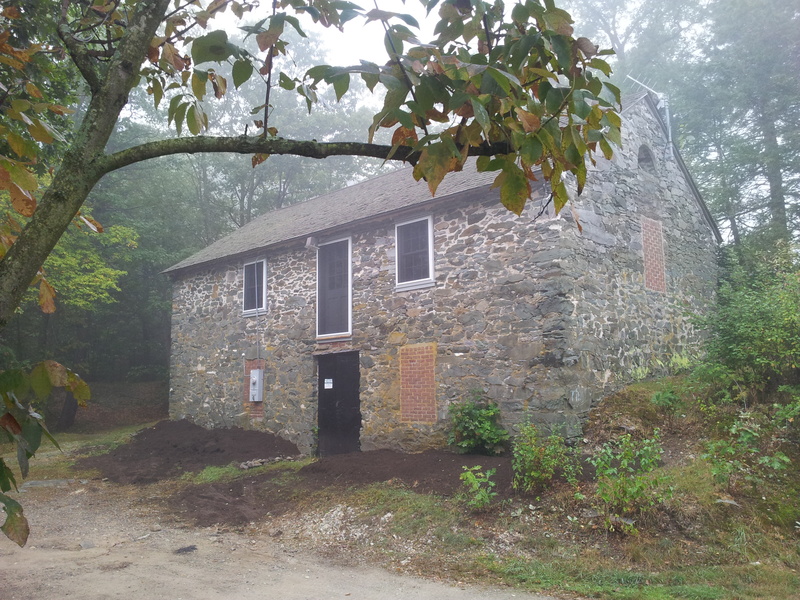 The Friends earmarked $2500 for a new floor and other repairs to the Stone Building, and that amount will be matched by the DCR. We will post a copy of the correspondence soon. This means that our long hoped for plans to make the Stone Building a great venue for Friends' activities will soon become a reality (February 2006). The new floor will, hopefully, be followed soon by the new windows, for which funds have already been generously donated by the Sangiolo Trust. On February 23, we were notified by the DCR that they are preparing to pour the floor very soon, and that the Friends will be asked for input on design. We have moved older Echo Bridge stories that have appeared on our web site to: Archive of Echo Bridge news stories. To the right: the Silk Mill in 1905, before construction of the "Horseshoe" or Circular Dam. Note the lower water level. From a postcard recently found by Bonnie and Rick Pearson. Click for a larger image. The Newton Conservators have a lovely page of photos of Hemlock Gorge. Click here to see them. Richard Kramer has also put up photos of Hemlock Gorge to share with us. Click here to see them. Panoramic photos of Hemlock Gorge taken by Steve Clark from the top of Echo Bridge show well the splendor of the Reservation and comprise the Friends' Four Seasons of Hemlock Gorge collection. Panoramas were pretty special back in 2000. Click on the small images below to see the Panoramas full size. Note: If you are using Internet explorer, you need to hover your cursor on the image to see it full size. An icon will appear. Click on it, and the image enlarges. Doug Cornelius posted a lovely account of canoeing through Hemlock Gorge a few years ago with pictures. Click here to see it. Another collection of photos of Hemlock Gorge is at Boston Online: Click here to see them. 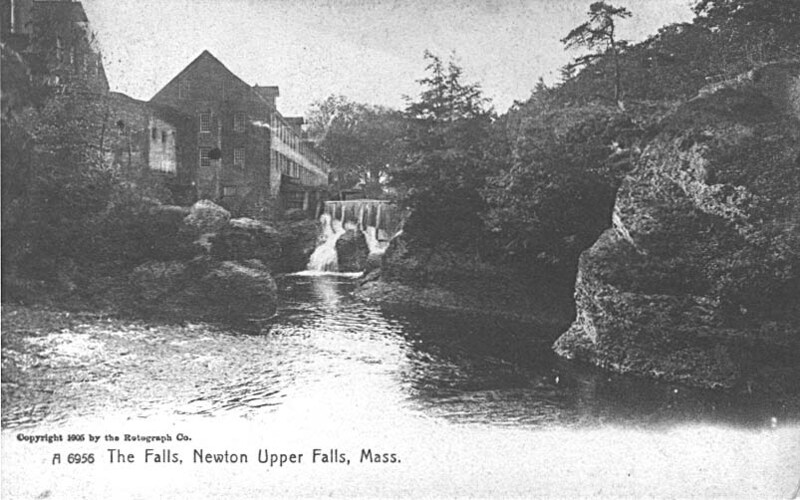 Makers of the Mold, a full-length illustrated history of the Newton Upper Falls community which borders Hemlock Gorge, is available only on the Web. Authored by Historian, Conservationist, and Friend Ken Newcomb, who passed away in 2002. Copies of the print edition of The Makers of the Mold can be purchased online and are also available at several local restaurants, convenience stores and cafes. The full list of outlets can be found here. This work is available onl at this Web site. Meetings are held at the Emerson Community Center on Pettee Street in Newton Upper Falls on the first Tuesday of the month unless otherwise indicated! For a MAP showing the location, click here. Saturday April 30, 2016: Annual Spring Cleanup of Hemlock Gorge. Volunteers should meet at Hamilton Place between 9:30 and 10 a.m. For a MAP showing the location, click here. Parking available at Hamilton Place, the Mills Falls parking lot, and at the Hemlock Gorge parking lot at the intersection of Ellis St. and Rte. 9. Spruce-up materials supplied and Refreshments provided for all volunteers! Please dress appropriately for the work and weather (rain or shine). Sunday, April x, 2015 Annual RUN of the CHARLES Canoe and Kayak Race. 1. Our most important Resource is People! The Woolly Adelgid, an insect whose advance northward threatens the forest in Hemlock Gorge and elsewhere. Legislation to combat the adelgid that was passed through our efforts. Land acquisition at the margins of the Reservation. This is a good site if you know which reservation you want to visit or if you want to see a map and choose a reservation near you. This is a Newton, MA organization that works to create sustainable solutions to environmental problems facing the city and the world. A community group focused on conservation of parks and open land in Newton. Hemlock Gorge borders adjoins the communities of Needham, Wellesley, and Newton. The Friends of the Fells is an all volunteer organization with a mission to protect and preserve the natural and historic resources of the Middlesex Fells Reservation. In addition, we assist the Department of Conservation and Recreation (DCR) formerly the MDC, in educating the public about the natural, cultural and appropriate recreational features in the Fells. The Friends of Breakheart Reservation is a volunteer organization dedicated to the preservation and improvement of Breakheart Reservation and Camp Nihan. The Friends of Lynn Woods have formed to ensure the perpetual existence of the Lynn Woods Reservation as outlined by the Indentured Trust of December of 1881. Our aim is to protect the Woods from development and exploitation, and maintain the Woods as a natural and unspoiled forest preserve. The Friends of the Blue Hills work to restore, preserve and protect approximately 8,000 acres of the Historic Blue Hills and Neponset River Reservations. Active volunteer committees work on the preservation of historic, cultural, natural, and recreational resources. The Friends also run a series of outdoor activities and workshops year-round. The Friends of Walden Pond is a key outreach activity of The Thoreau Society. The Society works with the Massachusetts Department of Conservation and Recreation, which manages the Reservation, to develop and sponsor interpretive programs that connect Walden, the book, to Walden, the place. The Society funds work to protect the spot that continues to inspire people in this new century as it did when it became Thoreau's laboratory, sanctuary and study in the woods. The Charles River Conservancy (CRC) is dedicated to the renovation, maintenance and enrichment of the Charles River Basin and its surroundings, particularly its parks, parkways, and bridges. Founded in 1999, the CRC is a nonprofit advocacy group that works to create better understanding of the best uses of the basin through education, public dialogue, and interpretive programs. Promotion of increased access, good planning, and management practices is designed to enhance the architecture landscape, and amenities of the basin. This web site is your window into the diverse work of The Trustees of Reservations, the nation's oldest private, statewide conservation and preservation organization. Since 1891, we have protected over 33,000 acres of land in Massachusetts, including 82 public reservations representing many of the state's most scenic, ecologically rich, and historically important landscapes. more than 29,000 acres of conservation land in Massachusetts, conduct educational programs for nearly 175,000 schoolchildren each year, and advocate for sound environmental policies at the local, state, and federal levels. We maintain 41 wildlife sanctuaries that are open to the public and serve as a land base for our education, conservation and advocacy programs. This website is keeping alive the memory of the Norumbega amusement park, a popular "trolley" park on the Charles River in the Auburndale section of Newton, MA. Norumbega Park opened in 1897 and closed in 1963. The famous "Totem Pole Ballroom" was located here. Text of legislation that was proposed in 1999 through our efforts to combat the adelgid. A Celebration for the Friends' late Historian and Author, Ken Newcomb was held on Thursday, November 19, 1998 to celebrate Internet publication of Makers of the Mold. Click here to see our photo album of that night. The Friends were honored with a beautification award from the City of Newton in 1997. Click here for the story. Click on the small picture to see a larger image of the award. You can send e-mail to the Friends or to our Webmaster at . You can contact the DCR Site Supervisor for Hemlock Gorge by writing to Erica Aubin at . Former site supervisor Kevin Hollenbeck () is now an administrator at DCR. The Friends of Hemlock Gorge Web Site went online on December 2, 1996.